Millinocket residents register their support Thursday for keeping the town's fire horn blasts. Jennifer Mitchell reports on Millinocket residents' decision to restore the town's fire horn. MILLINOCKET, Maine - The Millinocket fire horn will sound once again, as it has for decades, twice a day, every day. The sudden absence of the daily blasts has had residents up in arms for more than two weeks, to the surprise and dismay of the town's governing body, which decided in council action Thursday night to restore the tradition immediately. But the whole incident has revealed a town pushed too far. Sometimes a horn isn't just a horn. 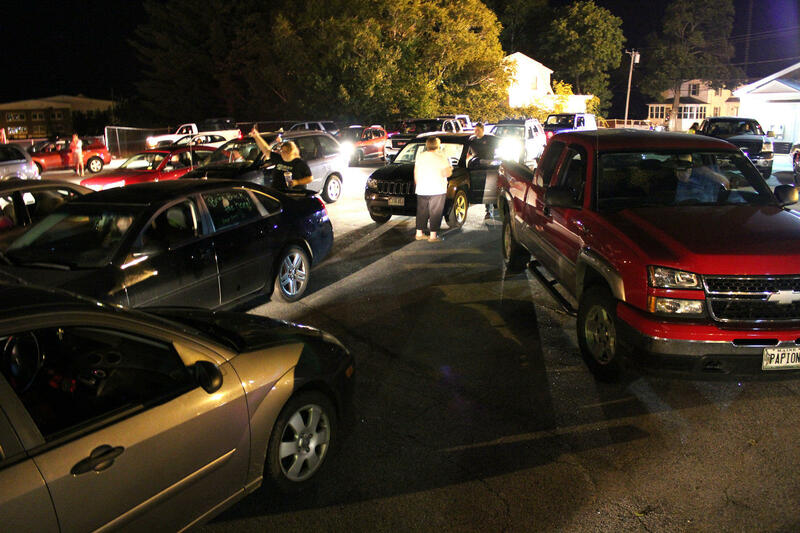 (Audio of car horns honking) This is the cacaphony that's shattered the air every night for two weeks in Millinocket: dozens of cars, hundreds of residents, parading through town like a funeral procession, to protest the sudden silencing of the town's daily trumpet. "You know, some people say, 'Oh, it's just a horn.' Well, it represents so much more than that," says resident Susan D'Alessandro. D'Alessandro says the town that was built on lumbering and paper has lost too much with the demise of the mills and the recent demolition of the smoke stacks that marked the skyline for generations. Losing the clockwork blasts from the fire station horn? That was the last straw. "All of us grew up with it," she says. Millinocket residents honk in protest earlier in August after the fire horn was silenced. In fact, the horn predates most everyone alive in the town today. In 1901, the town formed its first fire station. By 1913 Millinocket was a thriving mill town with a fleet of brand new wagons, sleds for winter time, a stable full of horses - and a shiny, new Gamewell alarm with a horn on the roof of the Penobscot Street fire station. The horses and sleds have gone, but the horn is still there - in the same location where it can be heard all over town. Since the 1940's and 50's, it's been sounded regularly at various times - start of day, lunchtime, 9 o' clock curfew, and to deliver special coded messages as well as to alert residents to real emergencies, such as fires. But not everyone was thrilled with it, says Town Manager John Davis. "So, I had a guy come in and complain and wonder if there was any reason to keep the horn on," Davis says. "So I checked with the fire chief and we talked and there really wasn't any - well, we didn't think there was any - reason to keep it on." "For my time is too valuable for me to waste another 17 months on such trivial issues than with the real problems that need to be resolved, I resign my seat on the town council effective immediately. Sincerely, Richard Theriault." There was a burst of applause that didn't sit well with Angotti, who chastised the crowd for being disrespectful and threatened to silence the microphones. It was a visibly tense start to a meeting that came after a tense couple of weeks. At times, testimony was emotional. 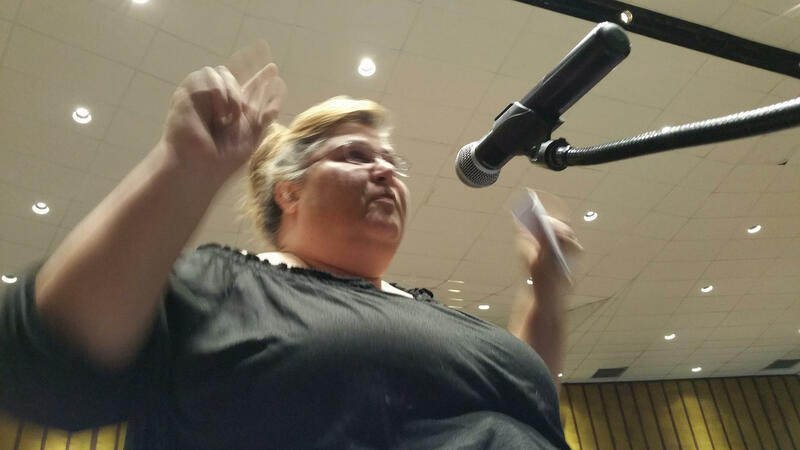 Horn protest co-organizer Tricia Cyr tells the council that it can empower and encourage the town by listening to the citizens on the horn issue. "I would like to be coming here tonight saying, 'Yeah we've got a big business coming here. Not worrying about a horn," said former state lawmaker and resident Herbert Clark. To him, the horn issue is an indicator of bigger wounds just below the surface - and he says even his grandson is aware of them. "Here's a 13-year-old kid telling his grandfather, 'What else are they going to take away from us? What else?' "
Millinocket's collapsed industries, low property prices, and a sky-high mill rate are big issues, said resident Tricia Cyr, but she says the council can inspire residents to solve the big stuff by listening to them on issues like this one. She thanked Town Manager John Davis for shutting the horn off "because it actually brought the town together." The council voted to restore the horn, twice a day, every day, and further amended the order to include a line explaining that the horn is a part of the town's heritage and tradition. The lone "no" vote came from Councilor Richard Angotti who said plenty of people don't like the horn, but won't admit to it publicly. And Town Manager John Davis, who has weathered heavy criticism for his decision to silence the horn in the first place, seems to have taken the whole matter in stride. "I guess I always knew that if you mess with the bull you get the horn. And now I found out, you mess with the horn, you get the bull," he said, evoking laughter. Davis said the horn would be restored immediately. MILLINOCKET, Maine - In Millinocket last night - for the third night in a row - a group of residents angry over the silencing of the town's fire horn flouted noise ordinances by honking their car horns in protest. For decades, Millinocket's fire horn has sounded twice a day, providing messages about school closures, fires and other events to the town via a sort of code, says protest co-organizer Dawn Boyington. "There was one complaint brought to the town manager and he decided that was enough to shut it down, without concern to any of us."